With the number of tools out there which promise to simplify your digital marketing activities, it’s difficult to know which ones to start with. This is why we’ve rounded up seven of our favourites which we think would be a great place for you to start! From scheduling tools, to video editing software, here are our top 7. Insightly is a CRM (customer relationship management) system which simplifies the process of monitoring clients and leads. With it’s Opportunities function it shows you at a glance which leads may need attention (for example, if you’ve phoned a potential client or not yet). You can even link your email address to your Insightly account to better facilitate prompt communication. And all of this functionality is in a convenient dashboard with an easy to use interface. Buffer is a great way to get started with digital marketing, and makes marketing automation so much easier. It has a basic interface, can handle multiple networks, and the set up process will optimise your schedule for the best times to reach your audience. There are even built in analytics tools, which makes monitoring your digital marketing even easier. If you’re looking to build up lists on Twitter, then FollowerWonk is the tool to use! It gives Twitter profiles a social authority rating so you can gauge whether or not they would be beneficial to follow (we recommend looking for ratings of over 40/100). There is also functionality to search for profiles by keywords used in their bios, or analysing the followers of an individual (particularly useful if you’re looking for a group of people with similar interests!). If you’re struggling to find interesting posts and articles to share with your followers, then DrumUp could really help you. You start by plugging in your networks, then add some keywords, and DrumUp will find the best, relevant, engaging content from around the web. You can then choose to either schedule it directly from DrumUp, or just copy and paste it into your own scheduler tool. The best digital marketing strategies aren’t just about social media, you should be integrating email marketing too. MailChimp’s “Forever Free” plan should be suffice for most small-medium sized businesses, so there’s no excuses. Beautiful emails can be made using a drag-and-drop editor and built-in templates, lists are simple to create and monitor, and the analytics are presented as simplistically as possible. Video is the most engaging form of content, so being able to create good video is paramount to having a good digital marketing campaign. Animoto provides a straightforward way to create professional looking videos in no time at all, and has a great walkthrough guide to make it simple for even those without prior video editing knowledge. Similar to Animoto, PowToon is an easy way to create captivating videos for your brand. You can create high quality animations in just a few clicks which promise to bring more engagement to your content. These videos are easy to create, but still look professionally made, so your customers are sure to be impressed! 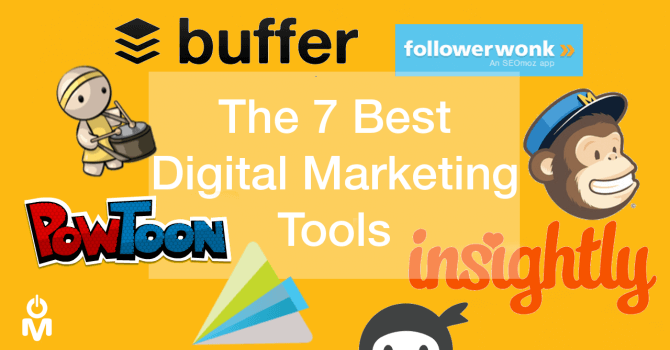 Do you have any other digital marketing tools which you like to use for your business?